1. Be prepared for a very long, drawn-out process. 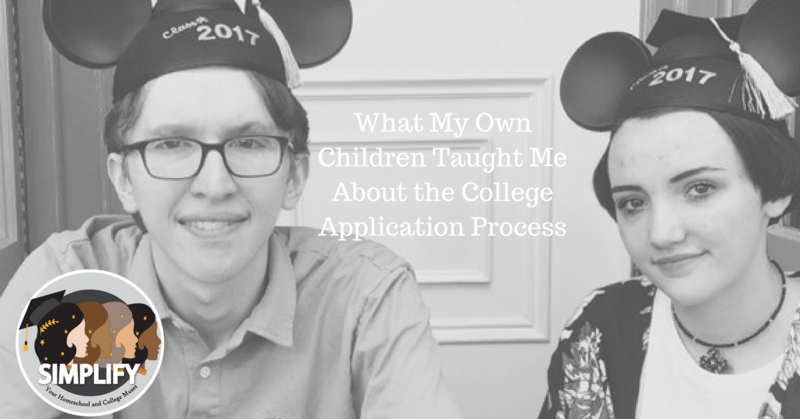 Realistically the college application period starts in late summer and can go all the way until May 1st depending on what colleges your student applied to and in what round (early action, early decision, regular decision) they applied in. And on the slight chance your teen is waitlisted at a school, you may be waiting long into the summer on a decision. 2. There are many important steps that need to be completed. In addition to the college applications, there are sometimes additional essays needed, financial aid forms (including the FAFSA and at some schools the CSS Financial Aid Profile), scholarship applications, and interviews. The actual application is only the first of many steps and all the steps are equally important. 3. ​School visits, even if they are just local, are essential. If you can tour the universities your student is interested in, I highly recommend doing it. Although many college tours have a similar feel to them, you can actually learn quite a bit about the school by investigating the campus. If you cannot visit too many at least try to visit some schools in your area with your student. Having a chance to tour a college will help them get a feel for the campus and hopefully get them excited about the next step in their educational journey. 4. ​Essays can make or break an application. I cannot stress this enough. A strong essay can help your student stand out from the thousands of other applications that a school receives. Have your student begin thinking about the essays as soon as the topics are available and stress to them the importance of brainstorming, writing, and re-writing to get that unique essay. Make sure the student is writing the essay themselves about topics and experiences that are important to them. When they are done, make sure you or someone else has time to proof-read them for spelling and grammar mistakes before they are submitted. 5. Teens need ownership over the process. As parents, and especially if you are a homeschooling parent, the tendency is to sometimes become too involved in the process. Remember that this is your student’s first step into adulthood and they need to be the one that is in charge. Let them decide what schools they would like to apply to, let them fill out the application and write their essays. You may be nervous about having them take over everything but they need to do this. It will help their confidence and will allow them to take charge of their own future. 6. ​Teens also need support during the process. At the same time be there as the support system they need. At times your student will likely become overwhelmed and will look to you for help and that’s okay. Advise on what schools you would apply to, what majors you would consider. Sit with them while they fill out their application if they want you there, proof-read those essays. Your support will go a long way in helping your teen get through this year. 7. Be prepared for the end result to be completely different from what you envisioned when you began this journey. In my mind I thought I knew where my twins would be at the end of the application season. I couldn’t have been more wrong. Over the course of the year, and after several college visits and interactions with different schools, both my twins changed direction. My daughter fell in love with a small, private local school that had a music department that was a perfect match for her. She had applied at the last minute though and mostly so she would have another safety school. That this safety school ended up being just the right place for her was a surprise to both her and I. As for my son, he ended up at a large, public school which I never thought would be for him and in a major I didn’t really know he was interested in (data science?). However, they are both very happy with their choices, and for me, that is all that matters.